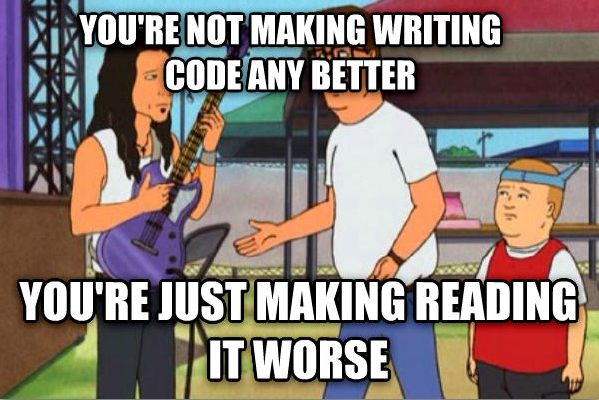 Resolution: This year I will focus more on making my code easier for others to read as opposed to easier for me to write. npm, binary modules, and module foundry is the first step towards easy npm native modules. igrigorik/ga-beacon lets you use Google Analytics to track your GitHub repositories. espadrine/gh-badges lets you put SVG badges on your GitHub pages. How Medium Is Building a New Kind of Company with No Managers talks about Medium and their take on Holacracy. For an industry that prides itself on innovation and “making a dent in the universe”, every time we let investors’ beliefs go unchallenged, we’re guaranteeing the future looks pretty much like the past. Except tomorrow’s winners are richer, younger and more privileged than the white men before them. Images of the computer code appearing in TV and films and what they really are wins the Interent for 2014.